Global investment in measures to combat climate change hit a plateau in 2012, according to a new report by the Climate Policy Initiative (CPI). Worldwide investments totted up to $359 billion (£221bn) – some $6bn (£3bn) less than the previous year. The CPI said this is significantly less than what’s required, quoting an International Energy Agency estimate that $5 trillion (£3tn) needs to be spent by 2020 on clean energy alone to keep global warming below two degrees celsius. The report found the lion’s share of spending (62%) came from the private sector, which stumped up $224 billion (£138bn). While the public sector chipped in significantly less at $135 billion (£83bn), the CPI said this was spent on measures such as incentives, low-cost loans and technical support – critical for attracting private cash. The study showed Europe was the world leader for investments in renewables, pumping £45bn into the sector. China came a close second with $68 billion (£41bn) and the USA came in third with $27 billion (£17bn). It also found investors were reluctant to try their luck abroad, as 76% of all spending – or $275 billion (£170bn) – was domestic. The CPI said there was one piece of good news in the report: despite falling investment in large-scale renewables and fewer projects, the increase in capacity was greater than in previous years. 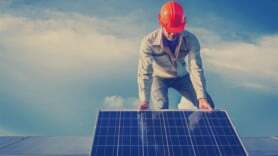 The findings chime with those of another report from Bloomberg New Energy Finance, which showed global clean energy investment is on course to fall for the second successive year in 2013.